Whatever Happened to Computer Hobbyists? by Louis E. Frenzel, Jr. The microcomputer industry, a field pioneered primarily by hobbyists, is now a major U.S. enterprise. Thanks to a never-ending supply of high technology components, good software and major shifts in the marketplace, the microcomputer field is no longer the curiosity it once was. Those responsible for building the first microcomputers, applying them to a wide variety of tasks and making us all aware of them, were computer hobbyists. But today, the big emphasis is on business, professional and industrial applications. Has the hobbyist disappeared completely? Let’s explore the changing role of the hobbyist in the dynamic micro marketplace. Firstly, how does one define computer hobbyists? One might call them individuals whose spare time is largely taken up with building and experimenting with various types of microcomputer hardware, software and applications. Hobbyists were the first group to take one of the early microprocessors, to combine it with some cheap semiconductor memory, and to build a completely workable digital computer. They built microcomputers in their basements, garages, workshops and back bedrooms, and got the personal computer market on its way. Of course, the introduction of the microprocessor in the early 1970s stimulated this activity. While the prices of the first microprocessors were more than an individual could bear to spend on a hobby, prices dropped steadily with increased industrial applications. Soon prices came within the reach of the average person. Scelbi introduced a microcomputer using the first eight-bit microprocessor, the Intel 8008, in 1974, and a magazine article published by Johan Titus in Radio Electronics gave construction details for a personal computer using the 8008. In 1975, MITS introduced its original Altair computer using the Intel 8080. Computer hobbyists bought these machines, and quickly and effectively brought them to a level of sophistication and practicality. But the computer hobbyist goes back further than that—to the mid-1960s. It was during the early and mid-60s that the minicomputer was born. As digital integrated circuits became cheaper and more widely available, the prices of digital computers began to go down. It became possible to build a minicomputer for less than $20,000. Within a few years, the $10,000, then the $5,000 barriers, were broken, thanks to integrated circuit advances. Electronic hobbyists and experimenters were also beginning to discover digital integrated circuits. It didn’t take long for them to realize that it was possible to design and build real digital computers. Before the integrated circuit, it was pure fantasy for anyone to dream of owning a computer with its thousands of tubes or transistors and its requirement for tons of air conditioning in a giant, raised-floor room. Experimenters began to design and build small-scale digital computers using the RTL and DTL circuits. The biggest problem was memory—semiconductor memories had not yet come on the scene, so the major focus was on finding a cheap, surplus, magnetic core memory. Once the memory problem was solved, it was relatively easy to design the arithmetic, control and input/output circuitry for a small digital computer. Some hobbyists took another approach. Many attempted to obtain a schematic of Digital Equipment Corporation’s low-cost PDP-8 minicomputer series. There were many attempts to copy this machine and other small, low-cost minis of that day. 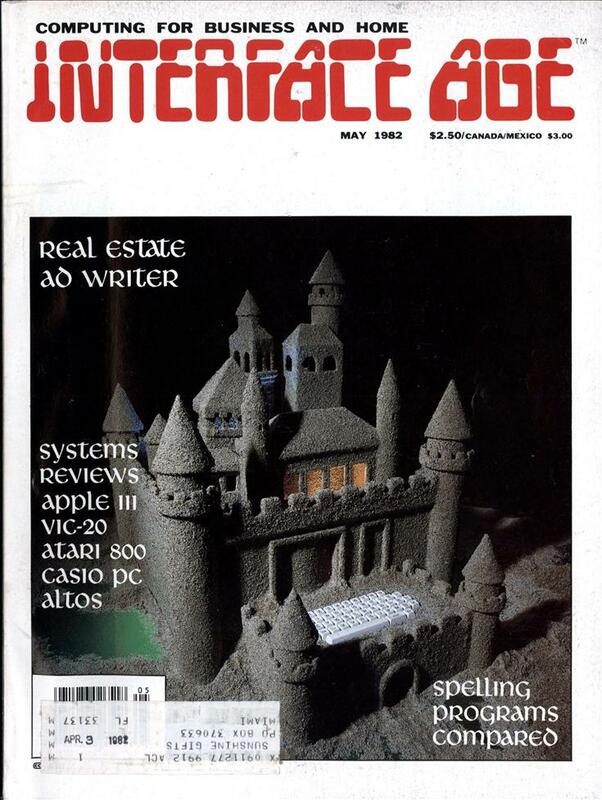 In 1966, Steve Gray, a magazine editor in Darien, CT, started an organization for computer hobbyists. Known as the Amateur Computer Society, its prime purpose was to help hobbyists who were attempting to build computers to communicate with one another and with potential parts suppliers. A monthly newsletter began in December 1966 and ran well into the early 1970s. 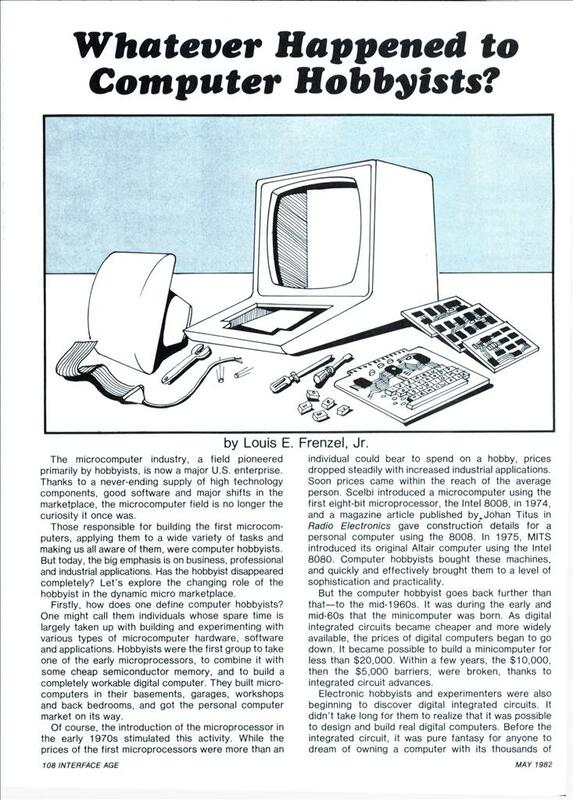 Many home-built computer projects were begun and completed with this publication’s help. So it was actually during the late 1960s and early 1970s that computer hobbyists began to appear in significant numbers. Hobbyists followed along with the technological developments, first with semiconductor memory, then with the microprocessor. With each improvement in semiconductor technology, it became faster, easier and cheaper for an experimenter to design and build a computer. The first microcomputer kits appeared in 1974 and 1975 and the computer hobbyists took a giant step forward. For every experimenter willing to design and build a computer, there were thousands more willing to buy and put together a kit. Thousands of the early kits were sold, many to hobbyists, who dominated the marketplace until 1978. In 1977, Apple, Radio Shack, Heath and other major manufacturers began to enter that arena. Their products enabled a new wave of applications, particularly in homes, small businesses, education, industry and science. Floppy disks and other software helped these applications to grow quickly. Hobbyists’ Interest vary Today microcomputers are a billion-dollar-a-year business. Hobbyists are still around, but are a much smaller portion of the overall market. Some hobbyists are interested in hardware, others, software, and others, applications. The great thing about computer hobbyists is that they will never master it all. The field is constantly changing as new technological developments emerge. Denser memory chips, more powerful microprocessors, higher quality I/O devices and higher density mass storage keep things lively. New operating systems and languages constantly challenge hobbyists’ software and programming interests. Applications are endless. Because of the general-purpose nature of the microcomputer, hobbyists never run out of ways to apply their machines. Most never grow disinterested. the hobbyists in with the home or consumer market. The two couldn’t be more dissimilar. While a hobbyist may play games too and use his computer to control his intrusion alarm, his main interest is more technical nitty gritty than canned applications. Despite the availability of many high-powered, low cost microcomputers, there are still purists who insist on designing and building them. Microprocessors, memory chips and other devices have never cost less or been more widely available. While many hobbyists enjoy the challenge of designing their microcomputers, others say that what they want is not available. For example, hobbyists have been dabbling with 16-bit micros for years, yet we are only just beginning to see reasonably priced commercial 16-bit machines. It is easy for an individual to build a microcomputer today. Many do this by buying integrated circuits from a mail order firm, wire-wrapping them on some perf-board, then spending hours debugging the resulting computer. But even when the computer has been built, the hobbyist’s work has just begun. In order to make his creation work, a builder has to program it. Sometimes software such as a Basic interpreter or a monitor program is available and can be quickly adapted to a new machine. In other cases, software is written and debugged. Another class of hobbyists buys inexpensive microprocessor trainers or board level micros and attempts to expand and enhance them. While they have saved themselves the trouble of designing the basic machine, the fun comes from adding memory, attaching peripherals and coming up with additional software. There is a special group of hobbyists whose only interest is building or enhancing their hardware. They really never actually use their machines and when they can no longer expand a computer, they start on another. This whole area of expansion and enhancement of small, low-cost microcomputers is a major activity. Hobbyists have banded together to form clubs and users’ groups to exchange information and experiences about various computers. Typical of the machines that have been popular in this regard are the old MOS Technology Kim 6502, the RCA VIP, the Heathkit ET-3400 trainer, Netronics Elf, and more recently, the Sinclair ZX80 and ZX81. It is satisfying to take a small, low-cost machine and add hardware or software, allowing it to do something it was never meant to do. Because hobbyists pursue their avocation as a sideline, they are, typically, limited in the amount of money they can spend. They constantly shop for bargain equipment. A businessman or home owner may opt for a complete computer with matching peripherals and software. But the hobbyist is willing to mix and match a variety of hardware and software products, prepared for interfacing difficulties and the need to create special I/O drivers to make a particular peripheral talk to a specific computer. Doing this, hobbyists not only save money, but have the satisfaction of making the pieces work together. One hobbyist, after years of dabbling with home-built machines, purchased a commercial computer, a used, inoperative TRS-80 model I. The model I is no longer produced and there are many on the used market. This one cost very little. He quickly found one defective IC, and for less than $1, had the machine in operating condition. He then bought an interface, also inoperative, made repairs, and also bought surplus RAM chips to expand memory to its 48K-byte limit. He is now operating with audio cassette mass storage and is saving for a floppy, but has purchased some low-cost cassette software still available for the model I. He is writing a Z80 machine code disassembler to dissect other users’ programs. Also, he recently found a console I/O typewriter from a Perkin-Elmer minicomputer and has been successful in interfacing this machine to his TRS-80 at very low cost. Another hobbyist is spending a great deal of time learning Forth. There aren’t many books on the subject, but he has obtained some by attending microcomputer shows and carefully scanning mail order ads. After working with Forth on an Apple II computer, he decided to implement a tiny Forth program on his Kim and a TRS-80 model III. He even belongs to a local Forth user’s group that meets monthly to share its knowledge and experience with the language. There are hobbyists who like to build kits, though they may not like to design their hardware. Except for Heath Company (which now belongs to Zenith) and a few small accessory manufacturers, there is a scarcity of kit sources. The smaller kit manufacturers stick with accessories such as beginner or training kits, or memory and I/O boards. Hobbyists buy them to repeat the feeling of successfully completing a kit, and to save some money by building it themselves. Programmers are special A special category of computer hobbyist is the one whose primary interest is software. While the highest percentage of hobbyists probably concentrate their attention on electronic hardware, there are some whose main interest is programming. These hobbyists purchase machines and spend their time creating software. Most interest seems to be in system software, where activities include writing operating systems, learning exotic new languages and creating special utilities. It was hobbyists who largely supported the movement toward the wider use and acceptance of Pascal, C, Forth, LISP and other esoteric languages. A hobbyist will occasionally have a practical streak and be interested in writing down-to-earth, usable applications programs. A major activity in applications software is taking an existing program for one machine and converting it for use on another, and hobbyists are masters at this art. A major interest for software hobbyists is games. While many games appear trivial or frivolous to the user, they are a real challenge to the programmer. Game writers do some of the more sophisticated and difficult programming today. Games are complex simulations and typically involve a great deal of mathematics and graphics. Games are the epitome of software success to a programmer and some of the best microcomputer programmers in the field are games programmers. It is fun to think up an interesting game, then write the program for it. Many hobbyists like to take their favorite games and attempt to write software for them. And, of course, most hobbyists still play games. Computer hobbyists are alive and well and living throughout the United States, Germany, Japan, the United Kingdom and other countries. But because hobbyists are now a much smaller part of the overall microcomputer business, attention has shifted from them. While the microcomputer field is expected to continue its enormous growth rates of 30-40% per year, the hobbyist percentage of the market is expected to decline. One recent market study indicated that the home and hobby portion of the micro market represented 25% in 1980 and is expected to decline to 15% by 1985. But while the percentage is declining, the number of hobbyists is increasing each year. It is a small, very active and healthy market whose growth will continue in the foreseeable future. I was a computer hobbyist in the Eighties – though I didn’t write machine code or anything advanced like this. Now I’m a real live IT professional, and have just spent the afternoon writing some interesting code to extract data from unruly XML files. Games consoles offer less opportunity to those who would like to play with the works of the machine instead of just with the supplied games, but with systems like Java around today there’s still plenty of opportunity for people to learn programming cheaply. They all writing iPad apps now. @Hirudinea — Some are. Some are hacking away with microcontrollers, too, which would have seemed absolutely magical back in the day. I still have a bit of a hard time wrapping my head around the fact that a complete single-chip computer, such as a small PIC or AVR, can be had for a buck or so, with basically no other circuitry required. It’s cheaper to program a little computer to do basic logic functions than it is to build them from gates and such. One of the other problems is that BASIC isn’t included anymore with PCs; Microsoft used to at least include QBASIC with Windows – they don’t even do that anymore. At least they offer VB.NET 2010 for free, but you have to hunt it down. I remember in the 1990s there was a great flurry of development in QBASIC (and QuickBASIC 4.5), but it died down after about 2003 or so. It seems to be coming back, though – a relatively “new kid on the block” is reviving the interest called “QB64” (http://www.qb64.net/) – its a full-on native code 64-bit compiler for Windows, Mac, and Linux that aims to run all QB code, while adding modern options. I’ve been playing with it for a few weeks now, and I have been very, very impressed. While it doesn’t have OOP options, it more than makes up for it with its other capabilities (want to write a QB program utilizing OpenGL? No problem!). @DrewE: Yep – a lot of kids and adults are being introduced to programming and electronics with the cheap microcontrollers now available (I am personally an Arduino fan). I have no problem wrapping my head around it; it was basically inevitable (the writing was on the wall when the PIC was introduced by Microchip – or even further back with people using the 8051 – then again, people have been playing with such small systems forever, though they haven’t been cheap – the number of homebrew robotics projects back in the 1980s that used 8-bit small systems like the Kim-1 shows this). Now for me, who first learned programming (of a simplistic nature) on a Milton Bradley Big Trak in the 1980s, then as I grew older, learning BASIC and programming all kinds of junk on my TRS-80 Color Computer systems – the fact that for around $10,000.00 USD I can get a “workstation supercomputer” (aka: NVIDIA Tesla) is just amazing. I figure in a few years time, such a system will be fairly commonplace as a PC (or something close to it). Already, cheap commodity motherboards are available with multiple PCIe 16X slots, with SPI support, allowing you to easily slot in multiple NVIDIA GPUs (or Physics Accellerators) – to enable more or less a similar system as a Tesla, for little money. Actually they are gathering in an open air museum in Finofurt of course!